Minli Tang, a City Law School PhD student and member of the Oil and Gas Law Research Group (OGLRG) reports on a recent seminar organised by the group. On 11th October 2016, a seminar entitled 'The Day the Sky caught Fire' was organised by the City Law School’s Oil and Gas Law Research Group (OGLRG). The distinguished speaker was Mr Robert Glynn (Director, Risk Management, Price Forbes & Partners Ltd). The event was well attended by students, business professionals and solicitors and barristers from the oil and gas industry. 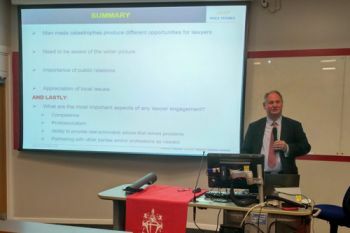 After showing an unforgettable film about a dramatic explosion which occurred in a large liquefied petroleum gas storage site in Mexico, Mr Glynn gave a presentation on the opportunities for lawyers in this kind of scenario together with suggestions regarding the roles that lawyers may be required to carry out after a man-made catastrophe. This covered the type of legal services required; the ramifications of the event; how to deal with client management and advice on how best to achieve settlement. Based on his years of experience as an industry expert and mediator, Mr Glynn gave the audience a very interactive and enlightening seminar. In the Q&A session, Mr Glynn received active feedback and many interesting questions from the floor, several of which were raised by experienced lawyers. Mr Glynn gave very detailed responses to all the questions. At the end of the session there was a drinks reception which gave the attendees an opportunity both to network and to discuss the seminar further. The OGLRG can also be followed on Facebook and LinkedIn.